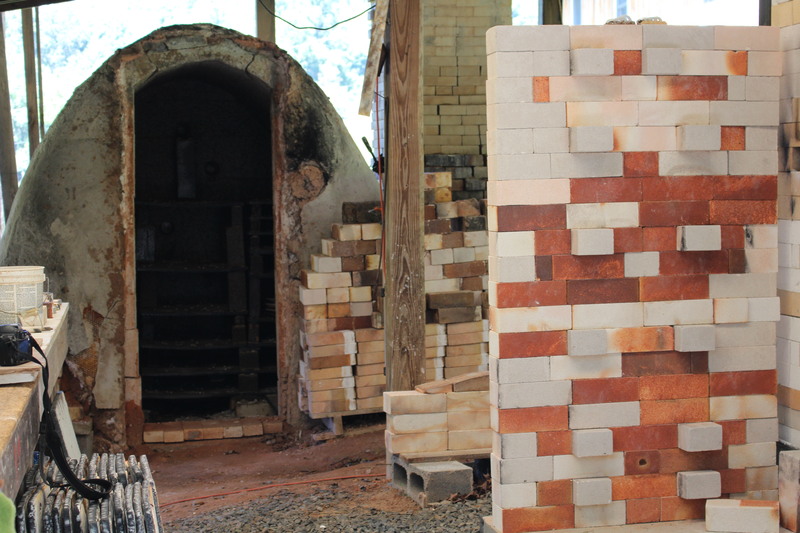 Outstanding in any field: Michael Kline Pottery | Oh, the Places We See . . .
Hand-thrown pottery vase with hydrangeas by Michael Kline., North Carolina potter. Who knew that a trip to the 2016 Apple Festival in Hendersonville, North Carolina, would have so many perks — a stay in a tiny house, tours and tastings at apple orchards, and drives along back roads through some of the most scenic country in the South. But a little-known (to us, at least) show and sale of contemporary art pottery just may be one of the best finds of the trip. 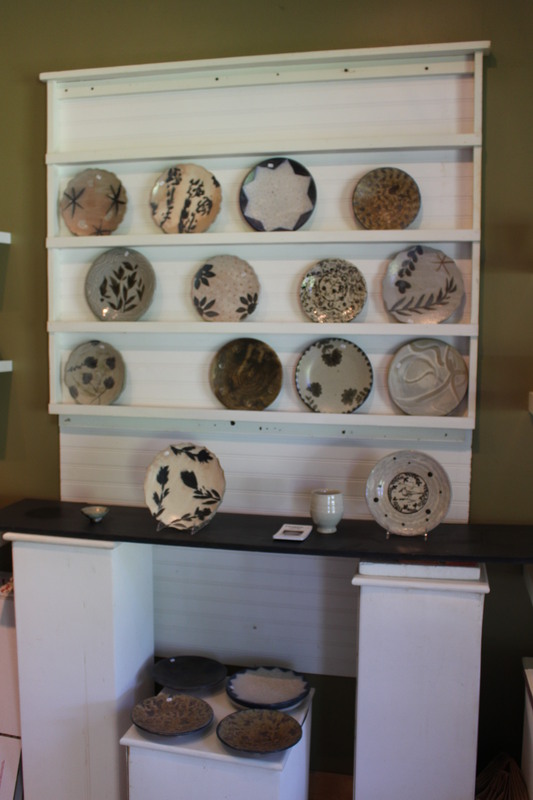 Cousins in Clay, featuring potters Bruce Gholson, Samantha Henneke, and Michael Kline with guest Kristen Kieffer, offered some of the finest pottery creations we’ve seen, all in a pastoral setting. Because we’ve been familiar with Michael Kline’s pottery for quite some time, we were on a mailing list advertising this Labor Day weekend show and sale. But being in Kline’s backyard and seeing the pottery was an experience in itself. Under the tent: Looking over the selection of Michael Kline pottery. Michael Kline greeted us by the tents in the field behind his house. And the more he talked, the more we felt like old friends, not just casual shoppers who dropped by on a summer’s day. Quiet, country view at the home of Michael Kline and Stacey Lane in Bakersville, NC. Turns out, his mother-in-law, Jackie Lane, is a friend of ours from Knoxville, a connection we never made before. But how fortunate for us: We enjoyed chatting with her and meeting her daughter Stacey Lane (Michael’s wife), a jewelry designer who teaches and displays at nearby Penland School of Crafts. Stacey Lane (wife of Michael Kline) and their dog Jack greeted us under the checkout tent. To say we were “wowed” by the pottery would be an understatement. With an earthiness that comes from a blend of clays, Kline’s pottery stands on its own with signature bold vines against pale, grainy backgrounds. Multiple textures, earthy colors, signature motifs — this is Michael Kline Pottery. Each piece was a treasure. From huge, hand-thrown pots, to chunky, hearty plates that would be starring pieces on any table, Kline’s unique pottery is easily identifiable. We could see it featured in any Southern magazine, showing classy clay pieces in a country setting or standing proudly alongside antique pewter and hand-blown crystal. With a shape reminiscent of an earthenware jug, this piece features a slightly darker background. Kline positioned this stunning vase in the middle of a long country table filled with pottery — quite the centerpiece! His newer work reveals an interest in detail — tiny, repetitive motifs — covering hefty mugs . . .
and forming delicate edges on serving plates. A rim of daisy-like motifs adorn this platter of subtle colors and textures. 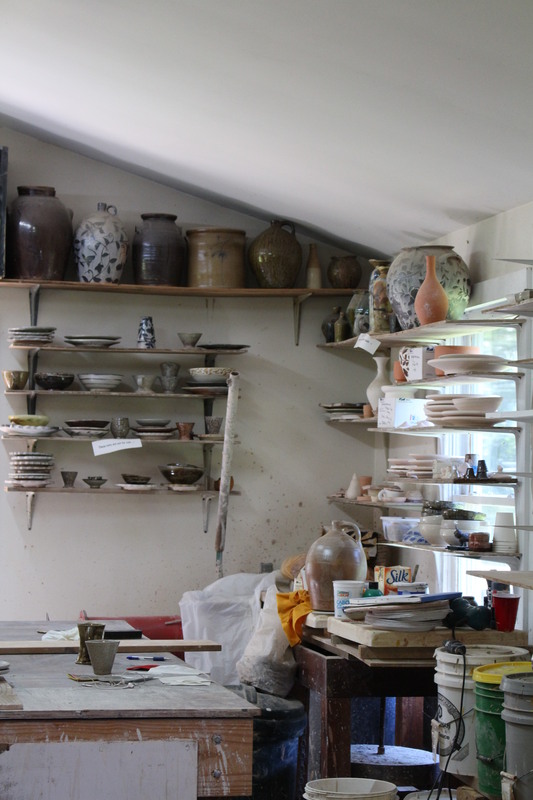 We wandered down to his studio, a simple house with tools of the trade: potter’s wheels, a utilitarian yet beautiful kiln, and pieces filling cupboards and tables. 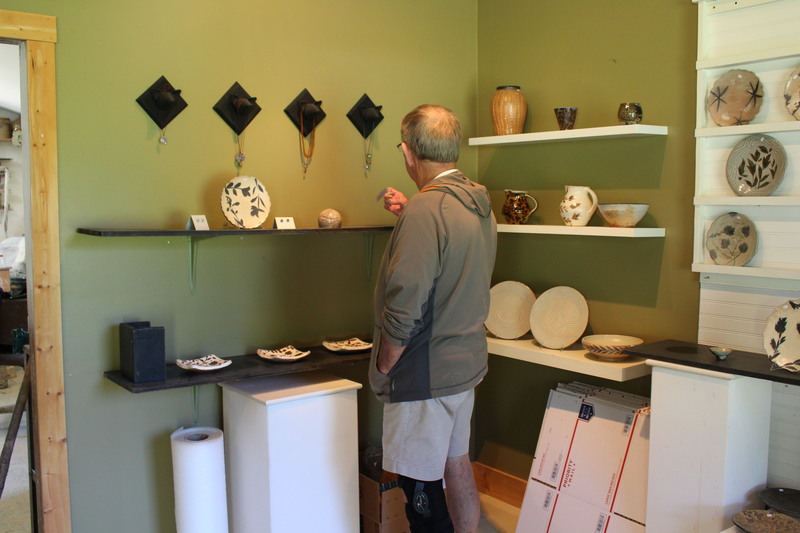 Bert takes a closer look at Michael Kline pottery. And who wouldn’t want to “set a spell” on this porch with summer flowers and stately pottery? Our serendipitous trip to little-known Bakersville, North Carolina, remains a fond memory. Fields of flowers, weathered fences, and an out-of-the-way workshop where the marvelously collectible pieces of Michael Kline Pottery originate — it doesn’t get any better, or any prettier, than this. One of our favorite pieces shows off what Kline does best: incorporate local clay and earthy colors for one-of-a-kind creations. Join us for more travels in North Carolina. Next stop: Penland School of Crafts! This entry was posted in Destination, North Carolina and tagged Bakersville NC, Cousins in Clay, Michael Kline, Penland School of Crafts, pottery, Stacey Lane, Stacey Lane Studio Jewelry. Bookmark the permalink. These potteries are very beautiful and special! You are so right, Amy. The quality is outstanding, and the setting couldn’t have been more pastoral and lovely. Thanks for commenting. Beautiful pottery! And making the connection of Stacy to Jackie is awesome – she looks just like her Mom! Thanks so much for taking a look at this pottery. It really is remarkable. And so are Stacey and her mom! What a scene! A pastoral setting to support creative thinking. Would love to see your niece’s pottery. My step-mother lives in Chattanooga, so I get there periodically. Thanks for letting me know about this — Please send name of studio. Appreciate the comment! Be sure and stop by, Rusha and tell Marian that we follow each other on Word Press. 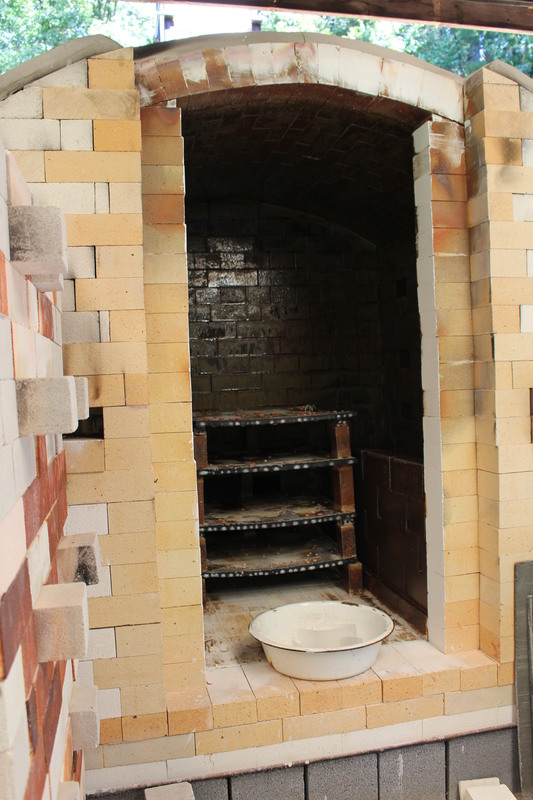 The studio is: Marian Heintz Pottery Studio. Marian also as a Facebook Page under the studio name. Thanks for sending info on your niece’s pottery. I’ve saved the name of her studio, and I hope to see it next time I’m in Chattanooga. One of those fabulous bowls and 2 coffee mugs. They look great in our house!!! And the memory of the event just makes it so much more special! Thanks for commenting. We love pottery fairs also — especially if it’s a gorgeous summer day with equally gorgeous wares! Thanks for taking a look. Thanks, Hester. We definitely agree. This is so creative, so different, but so versatile for where it can be used. Thanks for taking a look. Pretty. My mum would love that place! More than likely anyone would love this place. It was so quiet. Everyone was looking at the pottery but in a very quiet mood. Lovely! Thanks for commenting. Beautiful pots. Is it salt-glazed pottery? Love the delicate patterns achieved in the earthy tones. Debi, I wish I could answer your question about salt-glazed pottery. I’m not sure. But if I hear back from Michael Kline, I’ll answer you. Whatever it is, I love it!! Thanks for commenting. What great pots. I was once in N. Carolina with a friend who lives there and we visited about 5 places where people were making pots. It was so much fun. But I certainly don’t remember anything as lovely at this man’s works. Kline’s work is distinctive — definitely one-of-a-kind. What a pleasure it was to see it, touch it, and purchase a little of it! Totally off topic: did you see that game today! Absolutely! But from comfort of my home! Go Vols!!!! I couldn’t agree more. So distinctive, too. He has his own style. Appreciate your taking a look.